Hero Blog: Be My Valentine BLOGHOP! Welcome to the Hero Blog stop on the hop hop hop! If you want to hop hop hop from the top top top, then click here to go to the Stars and Stamps blog! Our heroes are taking part in this hop with some special things to share! This first is a card made by a hero, the husband of a cardmaker, who's now home - is this not the COOLEST card! Sfc C.E. is soooo talented! 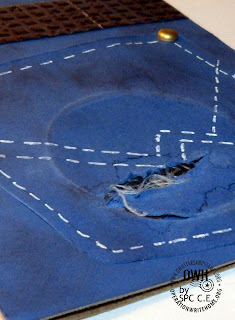 He did his own texture embossing and heat embossing on the belt, and the circle inside the pocket is the actual lid of a can of Copenhagen! Next we have a special gift sent to OWH from one of our recipients....these are contract and military personnel. Yes, we support more than just service members! 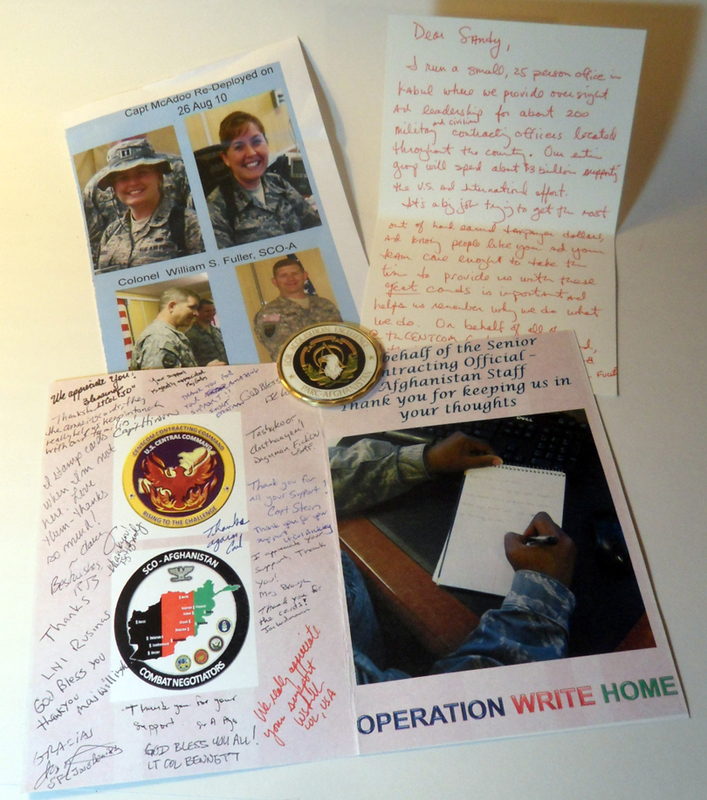 Our contact came home, so they made a special card with photos of her, as well as photos of the colonel and everyone, signatures from them all....not sure if you can see it, but the notes are typed out below for you. 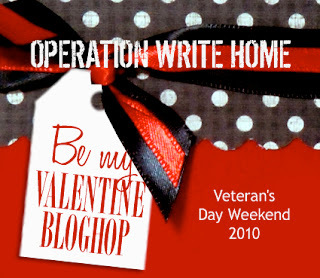 Operation Write Home, Thanks for your support! We have truly enjoyed the cards you have sent. We appreciate you thinking of us! Thanks for the amazing cards, they really help us keep in touch with our families! I stamp cards when I'm not here. Love them - thanks so much! We really appreciate your suppor! Thanks again for all your amazingsupport! They also sent a really cool coin! It's big and heavy....and is the first of these ever received by OWH! I run a small, 25-person office in Kabul where we provide oversight and leadership for about 200 military and civilian contracting officers located throughout the country. Our entire group will spend about $3 billion supporting the U.S. and international effort. It's a big job trying to get the most out of hard-earned taxpayer dollars, and knowing people like you and your team care enough to take time to provide us with these GREAT cards is important and helps us remember why we do what we do. On behalf of all of us at CENTCOM Contracting Command, I thank you for your patriotism and your contribution. So...are you inspired!?!?? 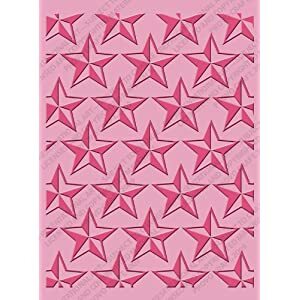 We've got a little gift for someone who leaves a comment on this post - a cuttlebug embossing folder! Leave some love for our heroes and have a chance to win! Comments made before midnight Sunday Nov 14th are eligible. The next stop on the hop is Stamp Fairy...you're going to love the adorable digistamp cards!! Thank you for sponsoring this.....you guys rock! These cards and notes are FAB - makes me get all misty eyed - especially having one of those very special people as one of my own!!! Keep up the GOOD WORKS!! The jeans card is awesome!! The feedback from our heroes is so amazing! It is great to be doing something that they truly find helpful and uplifting. Tomorrow I am taking some Christmas coloring pages to SS with me for my pre-K/K kids to color. That card is amazing! and the letters and coin were truly tear-inducing. What a special card and gift from our Heroes! Truly inspiring. These cards are just like their makers - AWESOME! Thanks so much for your service, heroes! Such a wonderful card! Thanks for sharing and being part of the HOP! I wish I could have played too but Fibro makes it too hard for me to spend too much time on the computer, and sadly I have to miss out! Bummer! I do, however, love OWH and also love creating cards when I can to help out!! Best Wishes!! thank you for sharing this with us. It's fun to hear from those that receive our cards. Love the jean card. That is so sweet and thoughtful of them to send back the photo card. The contractor letter is so awesome too. Wow, I'm inspired! Well that jean card is just wonderful. I think we will need a lesson on that one. The letter from our hero's is amazing, makes ya all teary! The jean pocket card is awesome. How creative. A big thank you to all our heroes everywhere. I hope you all realize how special you are and how much we appreciate all you do. God bless you all. That card with the pocket is a riot :) I love it! Thanks for sharing this and the sweet comments on the card - thank you heroes! Thank you OWH! Happy blog hopping to all! 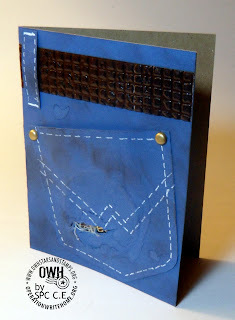 Amazing blue jean card! So many talented people. I also loved the comments from the service members. Now I don't know whether to continue hopping or go make some more cards! I love the blue jean card!! What a great card :) Thanks for sharing all the wonderful inspiration and thanks for ALL you do for OWH! I just love the blue jean card and the story of it's creation. And it is so heartwarming to see the feedback from the people who are receiving the cards! A fantastic blue jean card! So heartwarming to get the feedback! WOW- such a creative card !! The pictures and messages are so inspiring. I have to get busy. OMGosh! That jeans pocket design is so fun and fabulous! Thanks for sharing. Killer job on the belt! Thanks for all you are doing to support & honor our heroes! God bless you! It's a great card. Thanks to all of our heros for ALL that they do! Amazing - I love that card and for sharing those comments from the recipients. 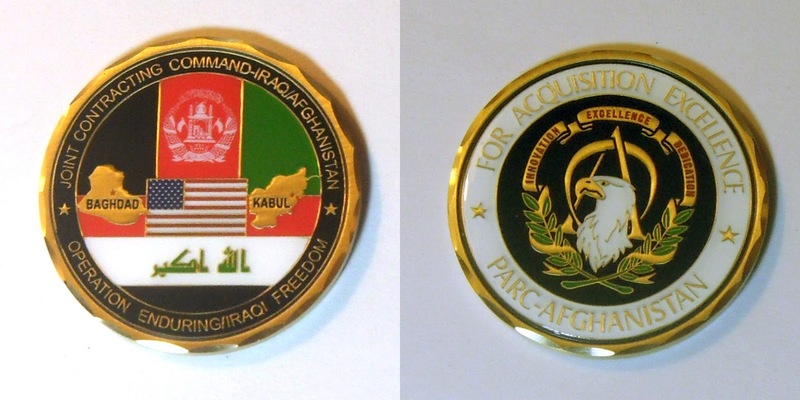 It must mean a lot to them - those coins are an honor to receive. I love this card and my hat goes off to all that you wonderful ladies do! 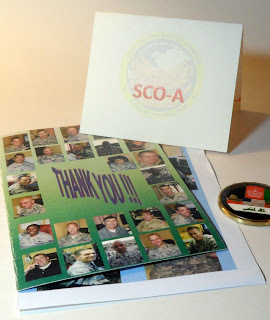 SFC C.E is a pretty amazing cardmaker =) Love all the love that our Heroes sent back! This post brought tears to my eyes. Thank you so much for sharing the comments received. wonderful inspriation to keep us all going. Very nice card. Thanks very much for sharing the inspiration and encouraging messages. Fun card. Love to see the Heroes notes. Thanks to the women and men of our Armed Forces. If anyone needs a little reality check, I am surely going to send them here! How inspiring it is to be a part of such a wonderful organization! Thank you for sharing. Love the card and that it was made by one of our heros! The jean card is adorable!! The cards, coins and stories on the Hero blog are truely amazing and inspiring, I check it every day!! Love the jean card! It is great to hear from the people we serve - sometimes, I begin to lose sight of the real men and women (and their families): each photo, note and story is fresh inspiration. I'm SO glad OWH is including contractors, as a number of folks I know are serving in that capacity. GREAT card!!!!!! And THANK YOU ALL for all you do for us. Thank you so much for your work for this wonderful cause. You truly are an inspiration. WOW!!! That is an incredible message. Love the pocket card and still feel my heart racing after reading those thank you notes. Thank you for sharing! Wow, what a great card. The copenhagen lid is a nice touch. What a grea surprise to recieve. TFS. I love the jean card. We inspire people to make cards. Wow I got chills all over me after reading the soldiers' comments. :) Very inspiring - I cannot wait to be more involved with OWH. Love the card.. would be great to send to a guy or little boy..
Love the jeans card! Very creative! the blue jean card is amazing and is a testimony to how much the troops appreciate what we do!!! Love the letters too! Let's keep up the good work!! The can lid in the pocket is truly an attention to detail touch! TFS! 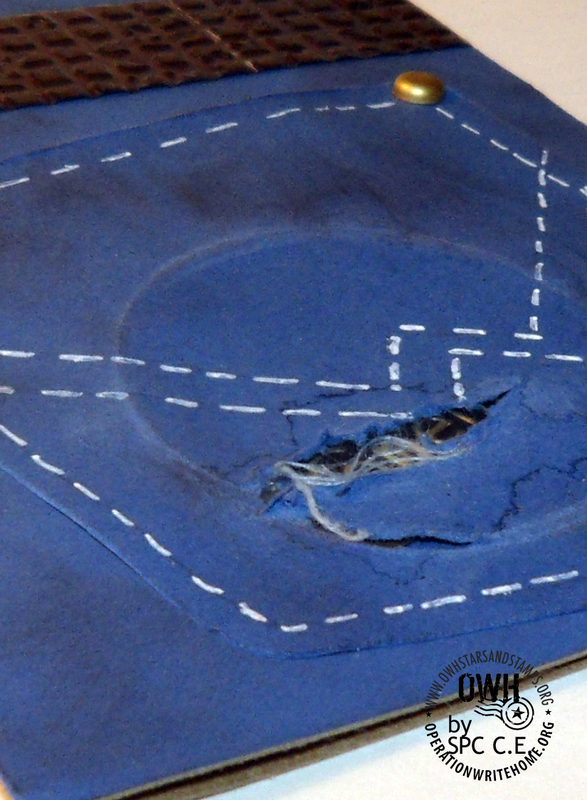 What an awesome post- from the Blue jean pocket to the coins- how cool is that? What a great thing you are part of! Love the jeans card. So creative! their card with the pictures gave me goosebumps! So awesome of them. The pocket card is fantastic and I am so impressed by his creativity! Thanks so much for sharing these - I'm totally inspired again. For all you do--Thank You!!! What a great blog hop this is!!! The card is amazing, but the thank you notes make me so thankful that we can do something to show our heros that we care. Thank you OWH!! Thanks for sharing the words of appreciation! Keeps me motivated! Thanks for the chance at the blog candy. Blessings to you! Ok, now that I'm all teary-eyed, I guess I'll go make some more cards for our troops. The picture of the uniformed hero writing to thank OWH is like the finishing of the circle: Us sending heroes thank you cards and cards to mail home, their families receiving cards from them and also thanking OWH, then back to the beginning again -- all of us being inspired to make more cards...! The card is amazing! Thank you for sharing your special mementos and photos. Love all the info we're getting today, and this card from one of our heroes is so cool! Our deployed civilian and military folks are deserving of the cards we have sent them and it is wonderful to see a card like tio know they appreciate the efofort of so many stampers! I am SO going to CASE this card!!! Talk about a perfect masculine card. Fantastic! Love the jean card. That is creative. Thanks to for sharing all those wonderful comments. Thanks so much for sharing the cute cards. Love that embossing folder too. I love the pocket card! That is too cool!! Love the card and the GENUS of the "Can" imprint. As for the Blog Candy, I've started to buy it for Ever. Thanks for the chance to win it. What an amazing card! A big hug and thanks to you for sending your thanks to OWH and those who care about you all so very much! (From a card making VET) Thank you for all you do for our country. How cool is that, such a great idea for a "guys" kind of card. Very very cool. Great card, love the belt and the Copenhagen ring! As the the card sent from overseas...how cool is that! So nice to know that they get a kick out of the cards. Inspires me to get back in the studio and get busy! Love the blue jeans pocket card. I love your imagination in coming up with it. How awesome to receive a letter of thanks for all the cards you send. Really an inspiration! Thank you for all you do, now I better get busy and try to support you with some cards too. How inspiring to read the words of the heroes we support. A wonderful card, so cute. The notes and pictures are a wonderful inspiration. This is what keeps me inspired. Awesome card! What a wonderful and inspiring message!!! Wonderful card! Ok... sniff, sniff... it's comments from our heroes like these that keep me so inspired. Now, if I can just wipe all the tears away, I'm on my way to the crafting table to get going on more! I love the jeans cards! Very creative! Having been part of OWH this year has been a big honor and to see and read how they feel makes on so glad they took the time to help create beautiful cards for our men and women, whether they are in the military or a support person. Thanks for sharing their thoughts. Those coins are super! Great card - so much inspiration found on this hop. Thanks for this opportunity. I am impressed that our hero's can also be so creative in their down time. 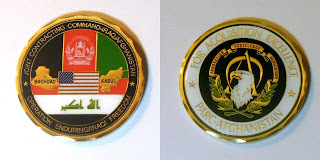 A challenge coin! How cool is that?! And the creativity of their thanks was outstanding. This is exactly why we do what we do. How much more inspiration do any of us need? Thank you for sharing! Please come and visit my blog too! Glad to see how appreciative our heroes are when they receive the many cards. Enjoyed reading this one. Great card! I'm sure anyone would love to get it and send it home! I love making cards for OWH and the comments you posted show why! Some day, I'd like to be as good a cardmaker as Sfc C.E. . . . . Mrs. Sfc. C.E. sure taught him well! And what lovely mementos from the troops--true treasures. LOVE that jean pocket card...fantastic idea. Congrats on being "coined". I love being a small part of OWH and hearing how much the troops appreciate what we do. Thank you so much for sharing your awesome talent with us!! I loved your card! I love making cards, and I'm so happy to share them in this way. You truly are heroes, all. Great card. Nice to see one of the guys getting involved. Great hop! Thank you for posting those letters! Gives us the boost to continue sending cards. I love to hear how much the soldiers love them! Thanks for sharing the feedback that you have gotten on the cards. It is great to see how much the cards are enjoyed! Dear Heroes... thank you soooo much for your service! you are appreciated more than you will ever know! ps... this card is AWESOME!!! I still haven't gotten the embossing thing down!!! Good job!!! Sfc. C.E., your card is amazing... very creative! I love that you used the lid of a Copenhagen can! Heroes, thank you so very much for keeping my family safe & free. For my children to live in a country where they can be anything they want to be!!! From the bottom of my heart, Thank you!! Very inspired, how cool is that?! The card, the coin, the letters, wow! Great card. Thank you for sharing and being a part of the blog hop.